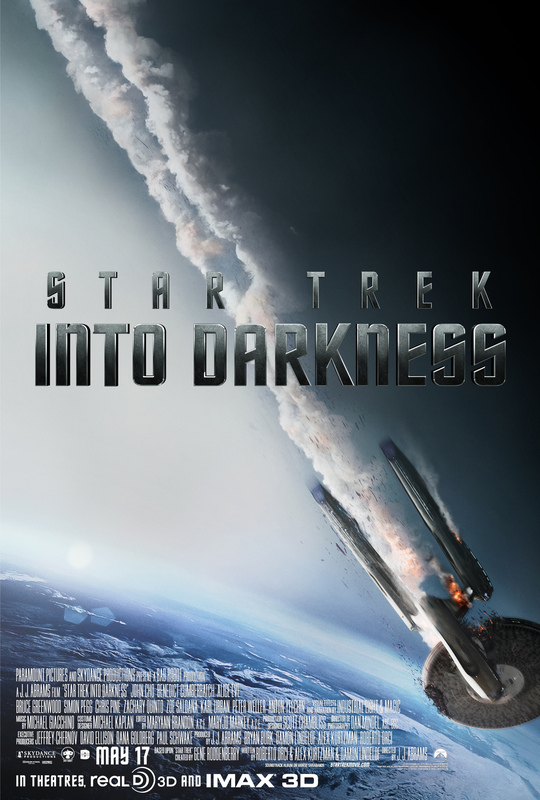 No matter what you thought of 2009’s Star Trek in relation to the fandom, Trek canon, or your own personal inner geekiness, it was a fantastic movie. It was exciting, funny, stylistic, and best of all surprising. And, for there to still be a way to surprise fans of the 45 year old franchise is quite the feat. This poster is so stupid artsy for an action movie it’s insane. It’s very hard to discuss this movie in any detail without spoilers- I will say that with the reboot to the timeline from the last film, everything old is new again! That’s not to say that the stories are rehashed, director J.J. Abrams and writers Roberto Orci, Damon Lindelof and Alex Kurtzman take all of these beloved characters and seeds of the original stories and throw them in a crazy blender and pour the contents on your screen covered in lens flares (yeah, the lens flares are back. They’re if anything more distracting then in the original)! Outside the plot of this reboot world, attention must be paid to the actors which now inhabit these iconic roles. For the most part, I feel about these actors much like I did about the original- new faces, new tweaks on essentially the same characters. In the sequel, these new actors have fully inhabited these roles. Zoë Saldana particularly brings an energy to Uhura that original actress Nichelle Nichols was never really given the opportunity to have. But then there’s Chris Pine. William Shatner embodied the character of James Kirk with bravado, charm, and humor. Pine seems to have put more focus on the reckless and hot-tempered parts of the character. Kirk now plays as a barely grown frat boy with an overactive hero complex. That’s not to say that wasn’t always inherent to that character it’s just that Pine isn’t gifted enough as an actor to really play layers. Shatner isn’t either, to be fair, he’s just had a lot more time in the role. The incredibly named Benedict Cumberbatch plays the villain, John Harrison, a mysterious psycho who has a vendetta against Starfleet. While the character will be known to Trek fans Cumberbatch’s portrayal is filled with a totally new menace. The character is twisted, methodical, cruel and most of all completely magnetic. His energy brings a new dimension to everyone he interacts with. Despite certain problems I had with his character, which I’ll get into another time, I think the actor was a really great addition to the ensemble. The title of this film (irritatingly without a colon for strange artsy reasons) is not a lie; this film is dark. Not literally as evidenced by the surgically bright bridge scenes, but thematically this film probably one of the darker Trek adventures I can think of. The darkness is tempered by competing themes of love, friendship and family. The combination of all of this doesn’t work super well. It’s not that these threads are woven throughout so much as they are shoved weirdly into each other rearing their ugly heads when you least expect them. There is one especially egregious moment which although played for laughs is so out of left field- and bookended by action sequences- you almost don’t even know it’s happening. It’s just a weird character development moment that even the actors seem confused. There wasn’t any part in the movie where I was bored, I was hooked the entire film. Good review Eric.